Learn the tricks of the trade so you can build and architect applications that scale quickly--without all the high-priced headaches and service-level agreements associated with enterprise app servers and proprietary programming and database products. Culled from the experience of the Flickr.com lead developer, Building Scalable Web Sites offers techniques for creating fast sites that your visitors will find a pleasure to use. Creating popular sites requires much more than fast hardware with lots of memory and hard drive space. It requires thinking about how to grow over time, how to make the same resources accessible to audiences with different expectations, and how to have a team of developers work on a site without creating new problems for visitors and for each other. 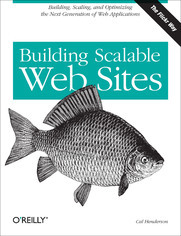 Whether you're starting a small web site with hopes of growing big or you already have a large system that needs maintenance, you'll find Building Scalable Web Sites to be a library of ideas for making things work. 1.1. What Is a Web Application? 1.2. How Do You Build Web Applications? 1.4. How Do I Get Started? 3.2.1. What Is Source Control? 3.2.4.5. And the rest . . .